A few weeks ago, my wife stopped by a roadside stand where an individual was selling apples. A lot of apples. My wife asked if there were any deals, and the seller told her that he would sell her 8 1/2 pounds of “seconds” (apples that had been dropped and needed to be used quickly) for $8. 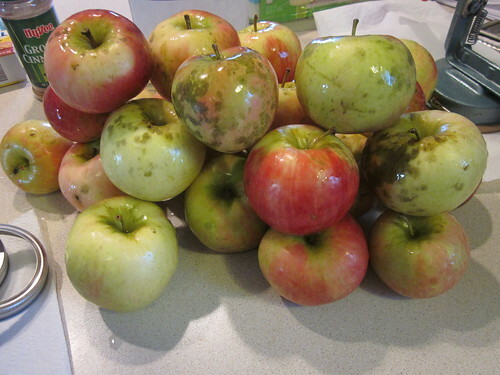 My wife jumped on the bargain and arrived home with a lot of apples in tow. So what exactly do you do with eight and a half pounds of apples? You make something with them, of course. We pulled out a recipe for “Caramel Apple Jam” from The Taste of Home Cookbook and modified it a bit, adding a bit of additional cinnamon kick to it (because we love cinnamon). 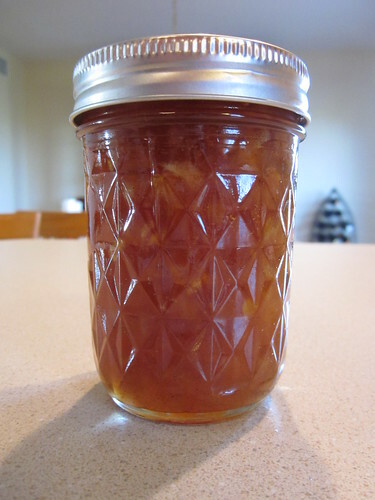 Of course, delicious homemade canned treats are wonderful to give away to your friends and family, so we decided to can most of the apples in the form of caramel apple jam. The first thing you need is jars. We picked up two dozen jars for canning the apple jam (and perhaps a later project). I really strongly recommend using new jars if you’re going to be giving them away as gifts (which was our plan). 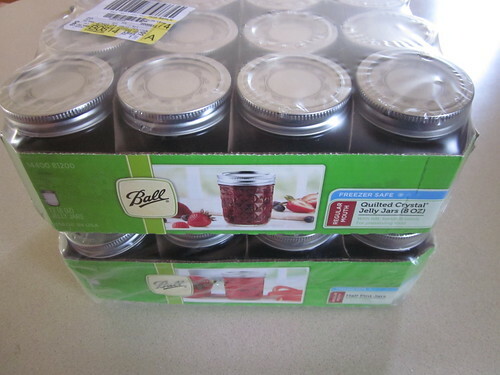 Sarah shopped around and was able to find a dozen jars with lids and rings for $5.99 – about $0.50 per jar, lid, and ring set. You also need a few pieces of equipment – things that can be reused if you begin to can things regularly. You need a stirring spoon, which you probably already have. You also need tongs (with which to move the jars around) – I recommend picking up tongs made for canning. We’re also using a funnel (which makes pouring liquids into the jars much easier) and a little tool that helps us to quickly see how much breathing room we have at the top of a jar so that we don’t overfill (it’s the blue notched thing). You can pick up this equipment at many department stores – often, the equipment you need here comes in a kit. You’ll also need a large pot. We use a four gallon stock pot. You can also get a canning rack to sit the jars in while dipping them into boiling water, but we don’t use one. Instead, we just put a towel in the bottom of the large pot before we add the water. This towel provides a soft bottom upon which we merely sit the jars, keeping them from cracking (which is the purpose of the rack). 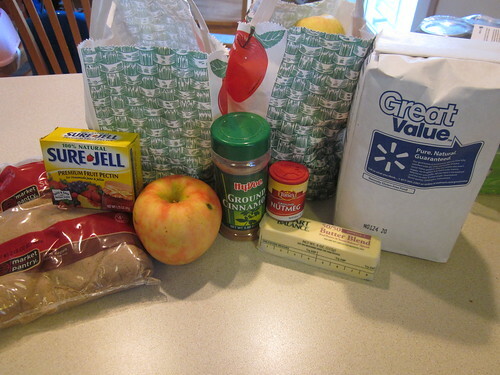 Here are the ingredients for the jam we made. You can basically substitute whatever jam or jelly recipe you like (in fact, we’ll probably present a second recipe later in this homemade gift series). 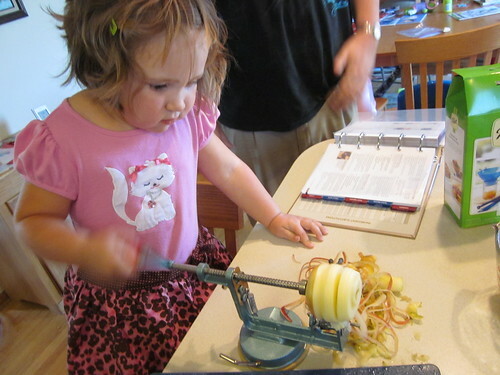 Peeling and dicing the apples is really easy if you have an apple peeler/corer/slicer, something we found at a yard sale a few years ago for $1. You just stick the apple on it, turn the handle (easy enough my three year old daughter can do it), and the device peels the apple, removes the core, and puts a big spiral slice in that apple. After that, you just have to chop the apple in the opposite direction to get the nice small pieces you need for the jam. 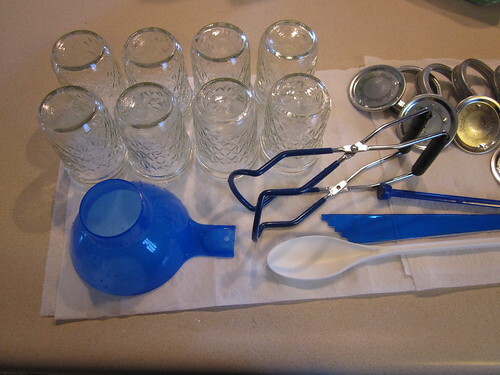 One thing you’ll need to do is boil the jars and lids to clean them. You can do this at any time in the process that’s convenient, as long as they’ve been boiled by the time you’re ready to put the jam in the jars. In a pan, combine the apples with the 1/2 cup of water and 1/2 teaspoon butter. Cook this over low heat for an hour or so, stirring regularly, until the apples are soft. At first, it will seem impossible that these dry-seeming apples and this little bit of water will ever combine with all of that sugar to make any kind of liquid jam. What will happen is that slowly, the apples will begin to give off liquid and, as the apples get soft, you’ll have about as much liquid as apple in the pan. When the apples are getting soft, you should get the boiling pot going. 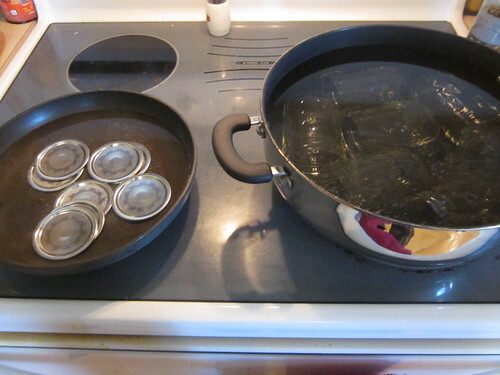 Put a towel on the bottom, then add water until your jars would be covered by two inches. Turn on the heat and get the water boiling! 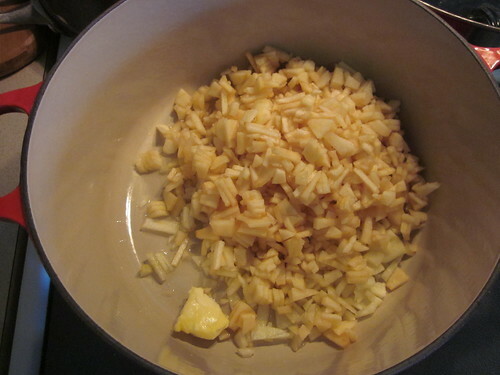 Once the apples are nice and soft (use your own judgment – you don’t want them to be really crisp in the jam, after all, but some soft chunks are delicious), add the pectin, stir it in, then bring the whole mix up to a rolling boil. Then, add the sugar. 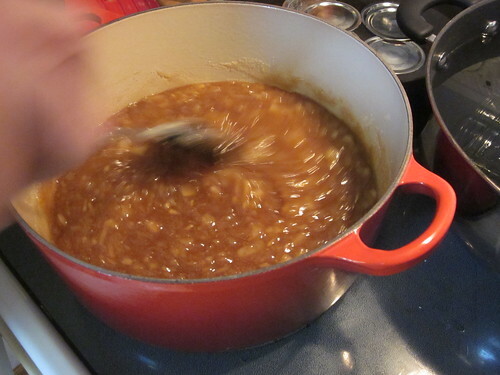 This is a fun part, because it all becomes a very thick liquid as you stir it. Bring it back to a rolling boil (and be careful here, it can splatter). Stir it constantly and let it boil for one minute. Remove the jam from the heat, then add the jam to the jars with a spoon until there’s a quarter of an inch between the top of the jam and the top of the jar. Clean off the rim of the jar, put a lid on it, then put a ring on top of that, turning the ring until you just begin to feel resistance. Repeat until you’re out of jam (we made six jars, with a bit left over to have immediately on toast). Take these closed jars and put them in the big pot of boiling water. 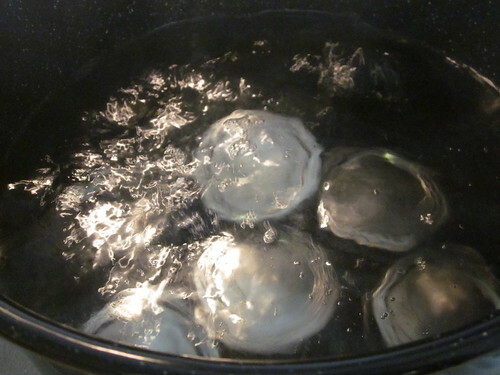 Keep the water boiling and leave the jars in there for ten minutes, then pull them out. Put the jars on a towel with a couple inches free space around each jar. Let the jars sit for 24 hours to cool and make sure after the cooling that the lids are depressed (meaning if you push down in the middle, it doesn’t “click” – if it does, the jar needs to go). And there you have it – wonderful jars of delicious apple jam! I recommend writing the contents and the date on the top of the jar after they’re sealed, for future reference.